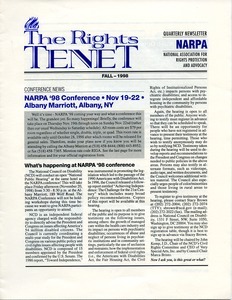 41 results found for: genres:"Newsletters"
1998 Sept. – 1998 Nov.
Rumford, (R.I.) - Includes: "NARPA '98 Conference"; "This just in from the Disability Law Project in Burlington, Vt."; Lawrence Stevens, "Does mental illness exist?" 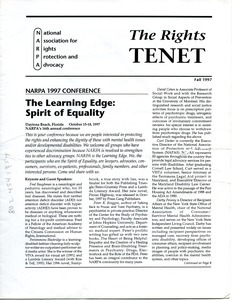 1997 Sept. – 1997 Nov.
St. Paul (Minn.) - Includes: "The learning edge: spirit of equality"; "Mental health advocate: the struggle for social justice"; Peter R. Breggin, "European survivor and doctor attacked by drug company"; Michael A. Susko, "Disturbing information from academia"; Bill Johnson, "Thoughts about things in general." 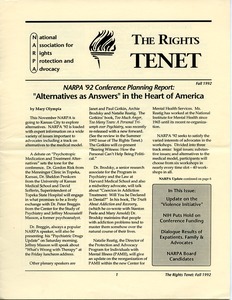 1992 Sept. – 1992 Nov.
Minneapolis (Minn.) - Includes: Mary Olympia, "'Alternatives as answers' in the heart of America"; Peter R. Breggin, "Update on the 'violence initiative'"; Lynne Duke, "NIH holds up subsidy for crime, genetics conference"; Paul P. Freddolino, "Family, consumer, and advocate perspectives"; Betty Blaska, "Found in an adult patient psychiatric handbook." 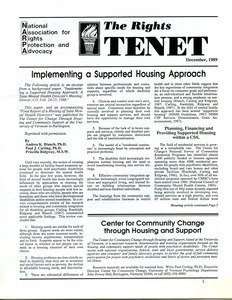 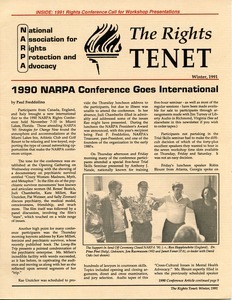 The Rights Tenet 1989 Dec.
Minneapolis (Minn.) - Includes: Andrea K. Blanch, Paul J. Carlin, and Priscilla Ridgway, "Implementing a supported housing approach"; "1989 NARPA Conference"; Sandra Everett, "Electroshock: the nightmare." 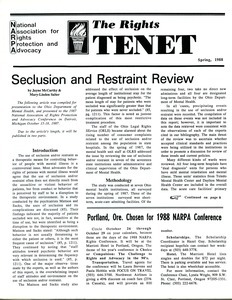 The Rights Tenet 1990 Mar. 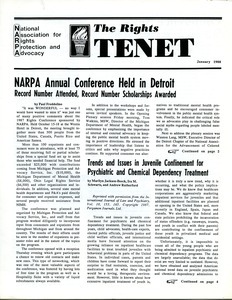 Minneapolis (Minn.) - Includes: Peter Breggin, "The scapegoating of American children"; "A new coalition for psychiatric liberation"; M. Renee Bostick, "NARPA asks for more P&A funding, access to records; Congress says no"; Mary Olympia, "Some days advocacy feels like hop, skip and trip." 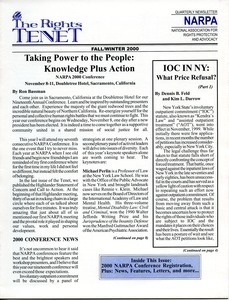 1997 June – 1997 Aug.
1990 Dec. – 1991 Feb.
Minneapolis (Minn.) - Includes: Paul Freddolino, "1990 NARPA conference goes international"; Leonard Roy Frank, "The Center for the Study of Psychiatry feature report: San Francisco puts electroshock on public trial"; "Drug lawsuit, drug companies, make Minnesota news"; Mary Olympia, "Editorial: the family of NARPA." 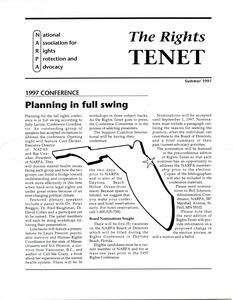 The Rights Tenet 1988 Jan.
2000 Sept. – 2001 Feb.